Meet with anyone, anywhere over the web—and work together as if you're in the room together. Deliver presentations. Share documents. Demonstrate applications. Even share control of your desktop to let someone else present. 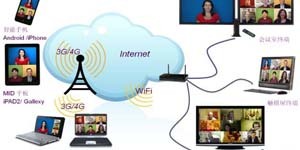 The Novius Videoconferencing Product Family provides an IP-based network videoconferencing solution, helping organizations make the transition to an Internet- driven world with instant, worldwide connectivity. Multimedia-enabled IP networks are here and videoconferencing is evolving into one of the key collaboration tools, enabling a wide range of internal and external communications. It is a flexible solution that helps you easily turn any flat panel display into a powerful system for meeting rooms. It delivers high-definition video quality, multiparty conferencing, and three different camera options to accommodate room size and configurations-all at a value price. It provides the performance expected of more expensive systems, in a sleek, compact, multi-featured package. This powerful quick set is ideal for small businesses just starting out with Videoconferencing or large enterprises looking to broaden the benefits of Videoconferencing throughout their organizations.